PM briefs on talks with Russian President and US Secretary of State over prevention of Iranian entrenchment in Syria. 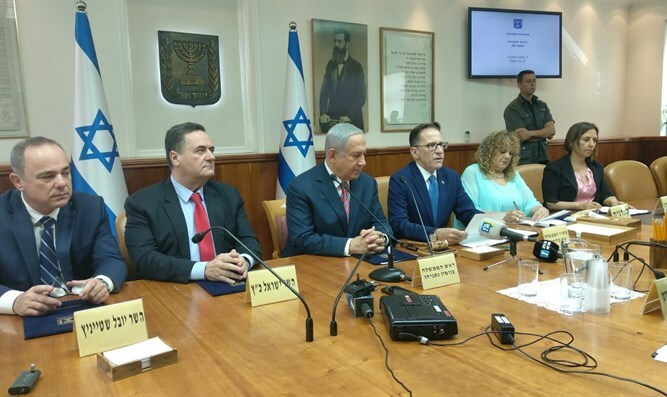 Prime Minister Binyamin Netanyahu opened the weekly cabinet meeting this morning with a report on his talks with Russian President Putin and US Secretary of State Mike Pompeo. "Over the weekend I spoke with Russian President Vladimir Putin and with US Secretary of State Mike Pompeo. We discussed regional issues and focused – of course – on Syria," Netanyahu said. "I reiterated our guiding principles regarding Syria. First of all, Iran needs to withdraw from all of Syria. Second, we will take action – and are already taking action – against efforts to establish a military presence by Iran and its proxies in Syria both close to the border and deep inside Syria." The Prime Minister emphasized that Israel would "act against these efforts anywhere in Syria."